I try to parent with a mind for what is most natural. I breastfeed, I practice EC (Elimination Communication), we converted to cloth diapers when Kaius was only 8 weeks, we happily co sleep, and I have breastfed full-time since the moment he was born. A few months ago, I started thinking about how I would go about introducing foods into my baby‘s diet. It wasn’t that I felt like I NEEDED to begin solids; it was more the pressure of society’s expectations that a baby would begin to eat between 4-6 months. Everywhere we went, strangers seemed to think that I should start feeding Kaius baby cereal followed by pureed ‘Stage 1’ baby foods. I would politely brush aside their comments choosing to rely upon my mother’s intuition. I felt that Kaius had no need for solids and was perfectly content with our breastfeeding relationship. Selfishly, I hated the idea of Kaius getting nourishment from any source other than my own body. I loved those milky moments of new motherhood and though I knew they would eventually have to involve food as well as milk, I was willing to wait until Kaius let me know that he needed more. Now that Kaius is nearing 6.5 months and has achieved the following milestones: sitting without support (and pulling himself into a sitting position on his own), has two teeth with a third making it’s presence known, mimics a chewing motion whenever I eat in front of him, grabs food off my plate, no longer pushes a spoon out of his mouth, and has a good start on the “pincer grip”, I have once again started to contemplate the introduction of solids. Over the past two months, I have researched the various guidelines for food introduction, and I have found one frame of thought that agrees with my mothering philosophy: Baby-Led Solids. The philosophy behind Baby-led Solids is that a baby will get most or all of its nourishment from breast milk alone throughout the first 12 months of his life. When a baby begins to illustrate his desire for food, it is more a desire to play with food and learn through this play how to feed himself. Baby will be able to eat most of the same foods as his parents and can take an active role in the family mealtimes. The Breastfeeding relationship will be preserved by avoiding the accidental overfeeding (and therefore fullness) that can result from spoon feeding. Basically, we will present Kaius with foods from our own plates that are soft, easy to hold, and pose little choking hazard. He will then experiment with them however he sees fit. If he is hungry, then he will learn to move the food from his tray to his mouth, chew, and swallow. If he is full, then he will not be accidentally forced to eat because there will be no spoon feeding involved. For me, the greatest benefit will be the preservation of our breastfeeding relationship. I’m not sure how I’ll feel in a year or so, but for now, I don’t want to lessen any of those precious nursing moments by even one feeding. Join me at Motherhood Moments to follow our Baby-Led Solids journey! Hold off on whole food as long as possible. It is best for the babies. Less allergies and etc. Just have to watch out for the teeth. Interesting concept. Good luck with it. Reading this post feels like I'm reading my own thoughts and experiences. After having “delayed” solids until 6 months, I feel like my baby is telling me she's ready for solids and I've been doing a lot of reading and feel that the baby-led solids approach is for us. But I am so nervous and am hoping for a book with guidelines as to what foods to avoid (nuts, dairy, etc. ), what foods are good to have and just any details for the baby-led solids approach. Many books seem to be written from a standpoint of having weaning in mind (which of course in a way, that is what is happening) but I would like to breastfeed long term. Any advise on good books would be welcome. Thanks! Gill Rapley (who pioneered BLW in the UK) has written a book called Baby-led Weaning: Helping Your Baby To Love Good Food. Gill's website is Rapley Weaning.com. 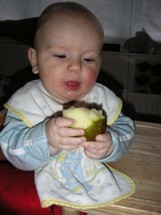 Another interesting website is Baby Led Weaning. Thanks so much. Just ordered the book! We've done this, is feel much safer to trust baby's oh so new instincts and tastebuds than to stuff food in their face until they take it, as I was told to do a a new mums class. It's meant a gradual weaning too, and children who clearly have a natural appetite control, something I feel might be interfered with by spoon feeding. I wonder if that is a contributor to my being overweight, and quick to habit eat – perhaps from those early messages.